"The King of Hearts card represents mastery of emotional development. The key word here is 'development'. With this card, they are working to master their emotional gunk and can be an example of how to do that for the rest of us. King of Hearts can lead by tapping into their humanity, kindness, and pragmatism which creates a place of emotional security for both individuals and groups (think Jackie Kennedy Onassis and Mother Theresa). They make excellent counselors or managers and often run their own companies, as they are naturally business-minded and are also caring about the needs of the people that work for them. King of Hearts are usually gifted communicators and possess a charming, warm sense of humor (think Melissa McCarthy). They have a clear-minded and democratic approach that inspires trust (think Robert F. Kennedy). Business partnerships appeal to them, as they have a sense of balance and fair play. 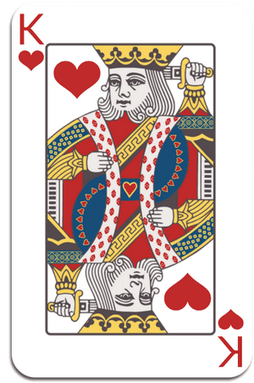 The King of Hearts make excellent partners, as the love affair card lies in their Moon position in their hand. They are more comfortable in a relationship, and usually find..."
Discover the key to unlock your transformation! Ready for more? Grab the full cardology report. Your second most important card. Out of that hand, your main card is your Birth or Sun Card (see up top). Your second most important card is the card ruled by your sign. Most people feel this card is just as relevant to them as their Birth Card and some feel it's even more dead-on. Dying to know more? Read the blog post. How you operate in romance and at work. While you may use your card the most, you can behave like the Jack, Queen and King of your suit in romantic situations and at work. ​Men and women are different when it comes to utilizing these three cards. Is your boss driving you nuts? Grab is birthday and find out which suit he is. Then check this report to find out why and what you can do about it.. Wondering why things are so magical with your new boyfriend? This report can give you a glimpse. Plus check out our Cosmic Connections. This 40+ page report tells you about these archetypes and how they interact with each other. Dive all the way in. ​Ever wonder why your life is the way it is? ​This ancient system has many layers and can tell you all about that. We've wrapped the most important ones up in a nice little kit for your card. We think all of this magic is worth at least $77, but we want a better world and that starts with you, so it's a steal. Wanna know more about what's in store for you right now? You have almost 20 cards for each year of your life and we can tell you all about them.